These past couple days have been a whirlwind here in Amman. The phrase ‘hit the ground running’ comes to mind. Only if I am indeed the runner, I’ve stepped out of the moving vehicle, took two unsure strides, then tripped over my own legs, face-planting in a tragicomic manner befitting America’s Funniest Home Videos. Toss your zinger whenever it comes to you, Bob Sagat. This guy seems to be able to multitask. Why can’t I? Of course this picture is in my mind more than anything I’m sure. Yet as my friend and fellow but-far-closer-to-being-a-legit freelancer friend Melissa Tabeek dashes off notes, interviews high-level officials and brainstorms story ideas like a pro, I can’t help but feel like I need to get to work on something substantive. And now. Yalla Matthew Yalla! I got a bit more into the swing of things a couple days ago. 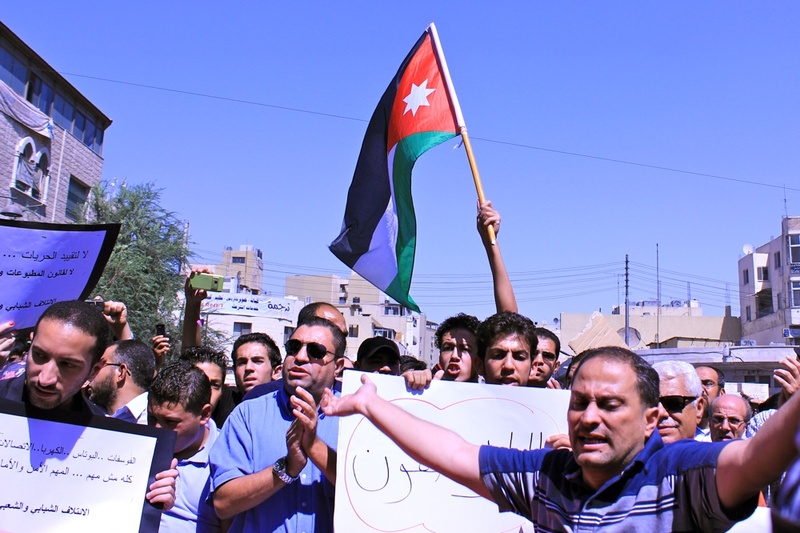 As happens on most Fridays here, protests were held both in the capital and elsewhere throughout the Kingdom. 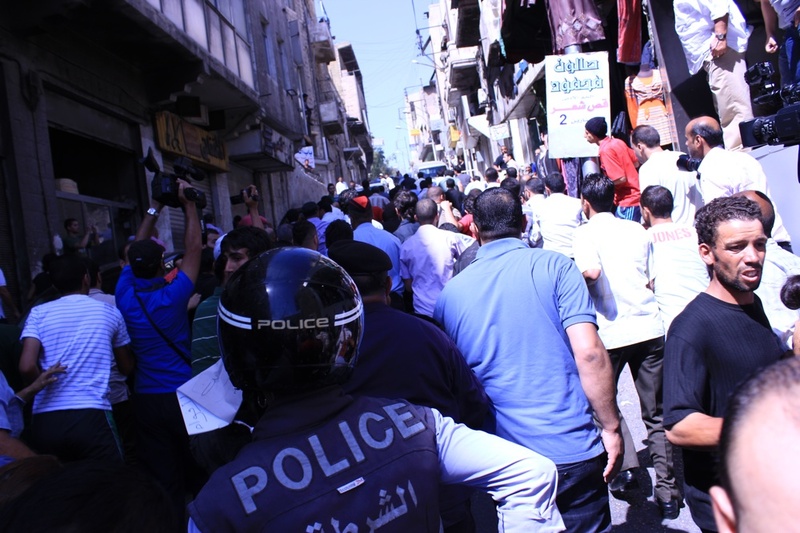 As has been the rallying cry of most of Amman’s protests over the last year or so, pro-reform activists marched down the main street from Hussein Mosque. 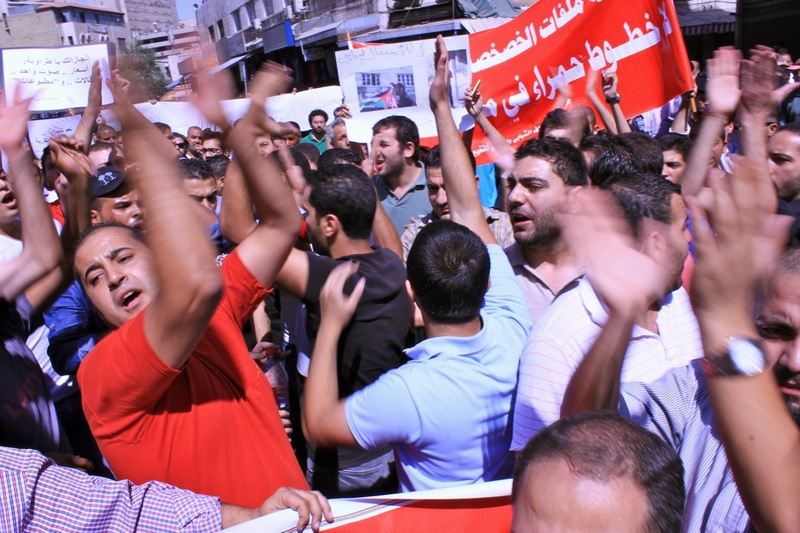 The demonstrators, many members of Jordan’s Communist Party, decried government corruption that they said leaves politicians living comfortably while the people suffer from federal ineptness. 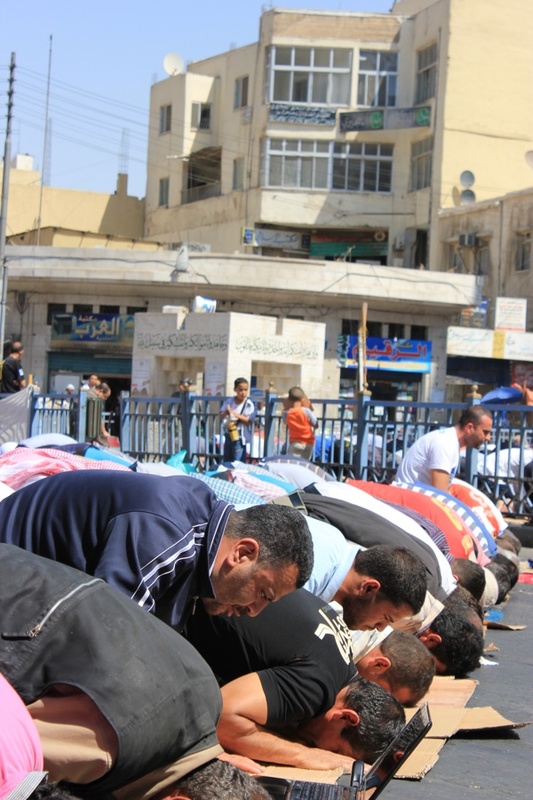 As is the custom, while Jumu’ah wrapped up and worshippers began stacking up their cardboard prayer rugs, protestors flooded into the street. 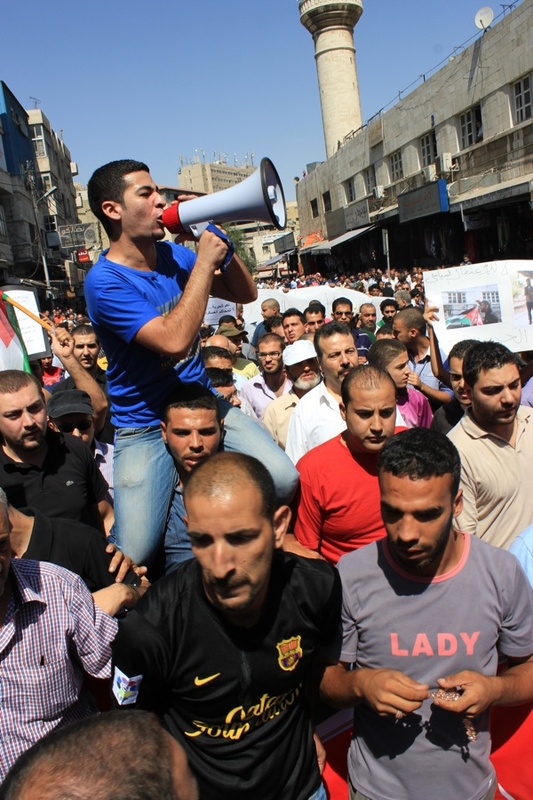 “Jordan is for the free!” shouted a diminutive rally leader perched on the shoulders of a comrade, megaphone in hand. The 300-strong waved Jordanian flags under a cloudless azure sky. Those at the head of the march unfurled prefabricated banners in the brilliant, unmistakable red of socialism. “Yes to free healthcare, yes to free education,” read one. Others carried smaller, less professional signs. 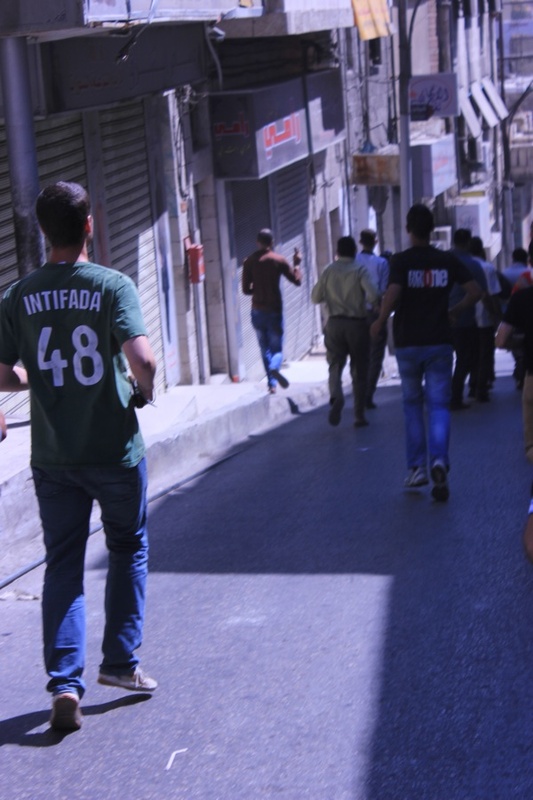 “Tarawneh’s accomplishments: raising prices, one vote law, arrests, media law,” read another, held by a teenage protestor in a Che Guevara shirt. “Freedom detainees, you are the past and we will follow you (to prison)” read a series of seven signs, referring to a rash of recent arrests of pro-reform, but peaceful protestors over the past couple of weeks. 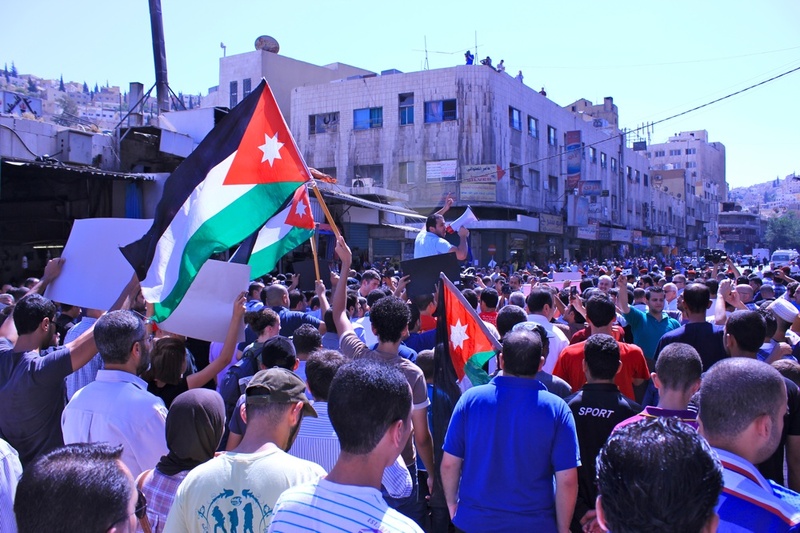 “The mukhabarat (secret police) should hear that the Jordanian people are not afraid of jail,” went one chant during the Friday rally. While government corruption and calls for reform are nothing new at demonstrations, arrests of participants under the guise of anti-terrorism laws seems to show a growing intolerance of speech critical of the government. It’s unsettling to say the least. Yet under the intense friday sun, police forces — whose numbers nearly matched those of the protestors — were content to form a barrier between the main protestors and small clusters of pro-government men, whose sporadic outbursts could be heard during the lulls in chants from pro-reformists. “This is King Abdullah’s Jordan, so if you oppose him get out!” shouted government supporters, some standing on ladders to draw attention to their cause. The reformers marched on, largely unconcerned with the counter-protest tagging alongside their own. 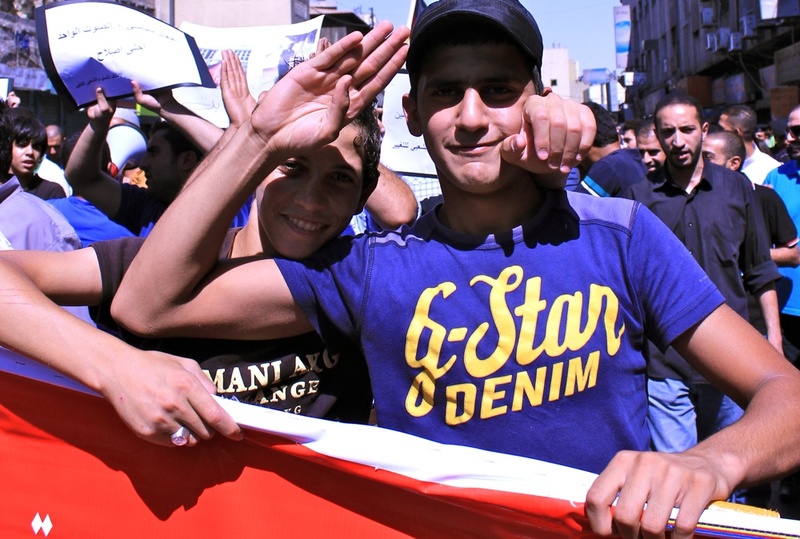 After about 30 minutes of marching, the demonstrators closed the day’s rally by singing “Mawtini,” a poem adopted as the national anthems of both Palestine and post-Hussein Iraq. 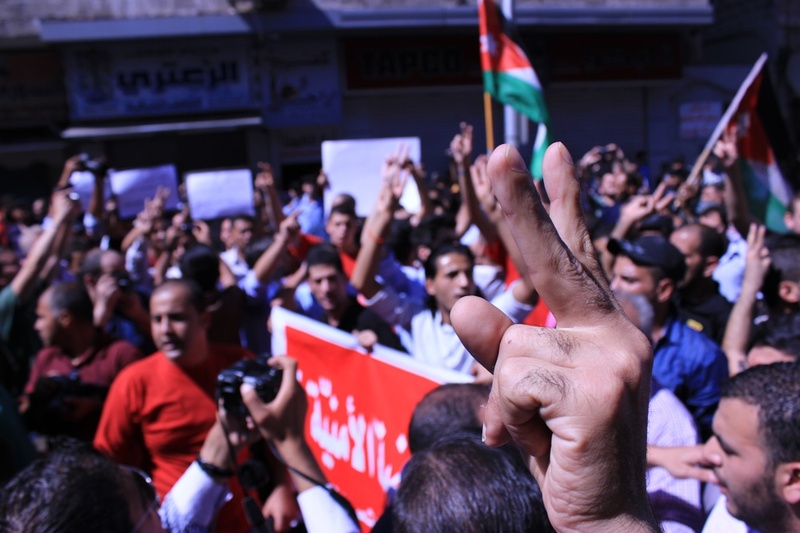 “No one will humiliate Jordan, even if we must tear down the whole system!” Despite the charged atmosphere, the protest was peaceful. While this anti-government rally was far larger and demonstrated a higher manner of organization than the one I attended in May, it also felt considerably less tense. Maybe it was the fact that I knew what to expect. Perhaps it was because I didn’t receive threats of being taken to the police like last time. I don’t want this to diminish the passion each side expressed, for that was unmistakable. But then again, maybe it was something else. For that half hour, as I scrambled amongst media, both sets of protestors, police and onlookers (puting on a clinic in the 5 Ds of protest photography I might add), I felt distinctly that this is the way it should be. 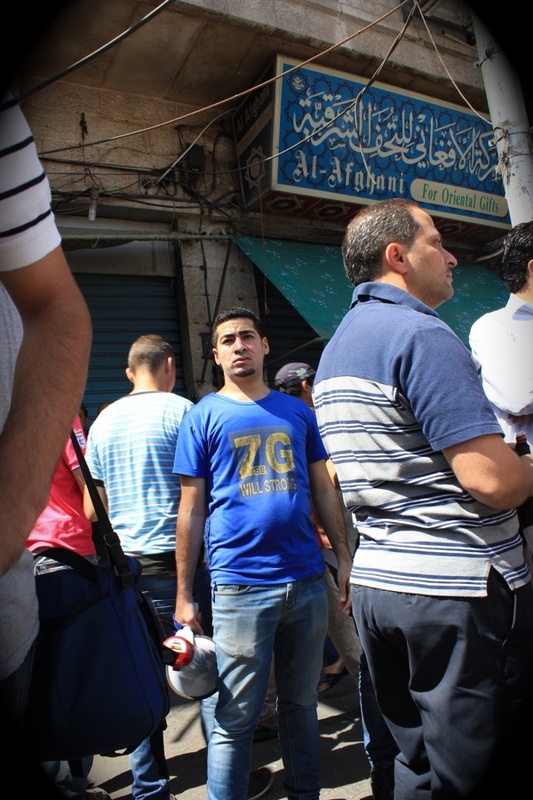 The overwhelming majority of pro reformers were Jordanian youth. With 70 percentof the Kingdom’s population under the age of 30, they stand to inherit enormous obstacles: a flagging economy, a bloated and ineffective bureaucracy, scant natural resources, and amid all of this they are surrounded by a region undergoing radical changes that threaten the stability of their little country. Countries much stronger have fallen into anarchy when challenged by much less. Lets keep it that way, eh Jordan? Yet despite all of this, they conducted the protest with a level of both professionalism and levity that has to make even critics nod in respect. They moved in one synchronized block, chanting in unison, their zeal cranked to 11, but always in check. They greeted people with honest embraces. I trotted backwards, snapping photos of two teenagers marching in lockstep behind one of those red banners. With bright smiles, they kissed me on the cheek and thanked me for recording their efforts. These boys were out to be heard, but that didn’t mean they couldn’t mug for the camera too. As the protest reached its conclusion, participants took part in a round of applause for everyone involved. The whole thing seemed to bring about a feeling of hope for what this country could be. 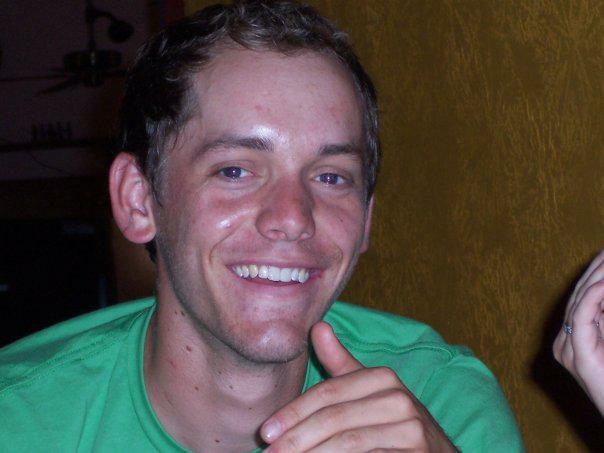 For even a usually insouciant gent like myself, I couldn’t help but crack a smile. Which makes what precipitated afterwards all the more disheartening. As we made our way back towards the masjid — Melissa interviewing a demonstrator while I reveled in the appalling sweat tattoo left on my shirt by my backpack (grey was a bad choice) — discordant shouts up ahead signaled a scuffle. Rushing up a steep side street, a small cluster of both pro and anti government protestors were locked in an amorphous embrace, kicking and punching, shoving one another into parked cars and up against shuttered storefronts. Despite the large numbers of police present for the protest, only a few made it up the hill to intervene, outnumbered and largely ineffective. 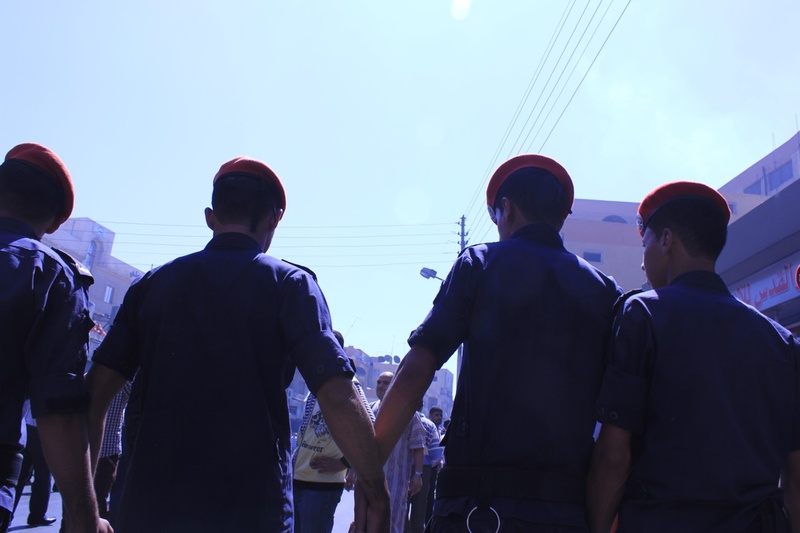 After about 5 tense minutes, the fighting broke apart and moved halfheartedly back towards the mosque on King Talal bin Abdullah Street, where the lions share of police discouraged any more squabbles. While there was only a small number involved in the fighting, it was disheartening to see nonetheless. One arrest was made, but the man was later released. And after that feeling of hope I experienced proved fleeting, the cynic in me returned. Just another friday in Amman. Too much to say, but I’ll leave it at that. « Hey Northeastern took a notice to our work! Mumtaaz Matt ! 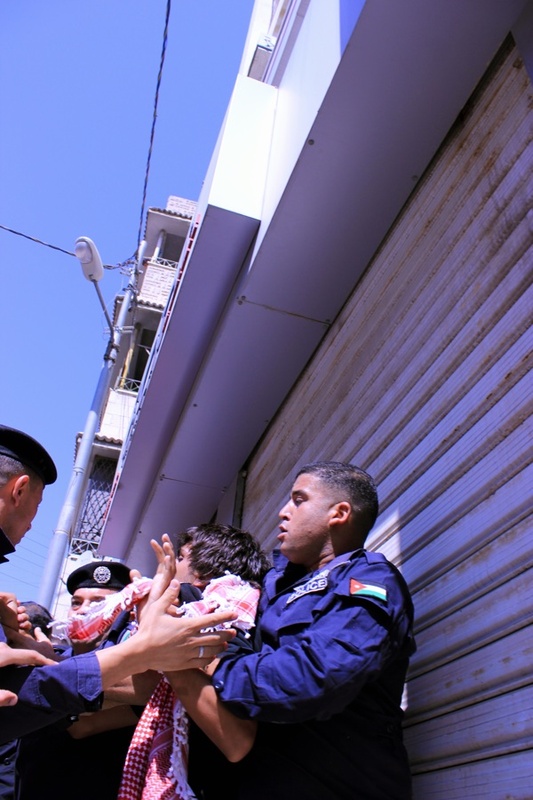 Great pics ,interesting story , seems as if the Jordanian people are trying to protest in a predominately peaceful way. Impressive and good for them. Your mom forwarded me the blogs. All I can say is “WOW” Matt. Love you. Be safe. You’re a rock star.